The Mexican presidential election will be held on Sunday, although for anyone living or visiting Mexico for the last few months, the results seem already to be a foregone conclusion: namely, the next President will be Enrique Pena Nieto, the Partido Revolucionario Institucional’s (PRI) attempt to reinvent and distance itself from its corrupt and authoritarian past with this relatively young and fresh candidate. Pena Nieto has more campaigning posters and advertisements than any other candidate, the institutional force of his party behind him (and possibly that of the narco cartels) and very favourable media coverage. Pena Nieto’s party, the PRI has been a monolith of Mexican politics – since the Mexican Revolution, the PRI held the Mexican presidency for seven decades until 2000, allegedly thanks to huge electoral fraud and its sometimes violent rule over the country was termed ‘the perfect dictatorship’ by Mario Vargas Llosa. However, its reign came to an end in 2000, when the presidency was won by Vincente Fox. Nevertheless, electoral fraud has plagued Mexico subsequently, especially in the last presidential election in 2006 in which there were allegations of fraud by second-placed centre-left Andres Manuel Lopez Obrador (commonly known as AMLO), who contested the win of Felipe Calderon. This procedural contestation was also accompanied by mass protests in the street by AMLO’s supporters, but did not in the end change the election result. Already rumours are circulating in Mexico of fraud at this forthcoming election, presumably in favour of Pena Nieto, including a statement from AMLO (who is also running in the current election) to this effect, and a claim from Jorge Alberto Lopez Gallardo, a university professor who analysed the 2006 election results and found statistical fraud, that these elections will not be any cleaner. However, the although the Instituto Electoral Federal has claimed that there is no chance of any fraud happening, to the incredulity yet resignation of the Mexican people. Opinion polls in Mexico present a conflicting story, also caught up with vested interests. Some of polling companies themselves have links to big business and the media in Mexico, and have consistently placed Pena Nieto in front of the other candidates. However, polling companies without these corporate ties have placed AMLO ahead of the other candidates. Aside from his party and whatever it may be doing to aid his coronation as Mexican president, Pena Nieto himself has a questionable background. His political record bears the dirty mark of the 2006 uprising in San Salvador Atenco, a town outside Mexico City in which flower traders who were being prevented from selling their wares at a local market in order to make way for a branch of Walmart, along with sympathetic local residents started a resistance, which was brutally squashed by the authorities under Pena Nieto’s control as Governor of the State of Mexico, including police using tear gas and live ammunition. There was at least one death (of a 14 year old boy) and allegations of various crimes and human rights violations by the police forces including including sexual assault, arbitral arrest and cruel, inhuman and degrading treatment of those arrested, claims which have not properly been addressed by the Mexican authorities. Furthermore, Pena Nieto’s personal life is far from spotless. He has had numerous extra marital affairs and children born of these liaisons, and rumours abound about the mysterious circumstances of his first wife’s death at a young age, with speculation (although no hard evidence) that he played some part in her passing or that she committed suicide. Pena Nieto also enjoys a cosy, Berlusconi-esque relationship with big media in Mexico, and it took the UK Guardian to expose various documents that came into its possession reportedly from the Televisa network which showed that it had sold politicians, in particular Pena Nieto, favourable coverage in its major news and entertainment programmes, and used these programmes to disseminate unfavourable opinions about his rival AMLO. In addition, the US embassy cables released by WikiLeaks also show that US diplomats were concerned about Pena Nieto paying for favourable television coverage from 2009. The Mexican media is dominated by Televisa and its rival TV Azteca, while newspaper readership and Internet penetration in the country are very low, in a scenario reminiscent of countries such as Italy, and so favourable coverage for a politician on these networks is of crucial importance to winning elections in practice. To darken the picture for Mexican democracy even more, there are also allegations about Pena Nieto’s relationship with another branch of Mexican institutional power, namely the narco cartels which have turned parts of the north of the country in particular into brutally violent and more or less lawless zones of their influence. Current president Calderon himself claimed that should Pena Nieto win the presidency, he would approach the narcos with a soft touch and court a close relationship with them. Furthermore, Pena Nieto’s party the PRI has apparently enjoyed a 30-year long relationship with organised crime in Mexico, with allegations that various PRI politicians in the 1980s knew about the north-bound drugs routes through Mexico and did not act on this information at all. In the midst of this furore over Pena Nieto and the presidential elections, an interesting Internet-based social movement, #YoSoy132, has emerged after Pena Nieto gave a speech in May 2012 at the private Ibero-American University in Mexico City during which he was questioned, heckled and members of the audience outrightly rejected his candidacy for the presidency, the first time during his campaign in which he did not encounter a supportive audience. This challenging forced the shamed Pena Nieto to hide in a toilet to avoid his detractors until his security personnel could find a route out of the building for him, and even then he was booed as he left the university. Interestingly, the Ibero-American University, along with its other private counterparts, is frequented by the children of the upper classes and not usually thought of as a hotbed of revolution or anti-establishment activity. It was claimed that those opposed to Pena Nieto were not real students of the university or had been paid by AMLO’s campaign, which outraged the Ibero-American students, 131 of whom uploaded a video of themselves and their university ID cards to YouTube. 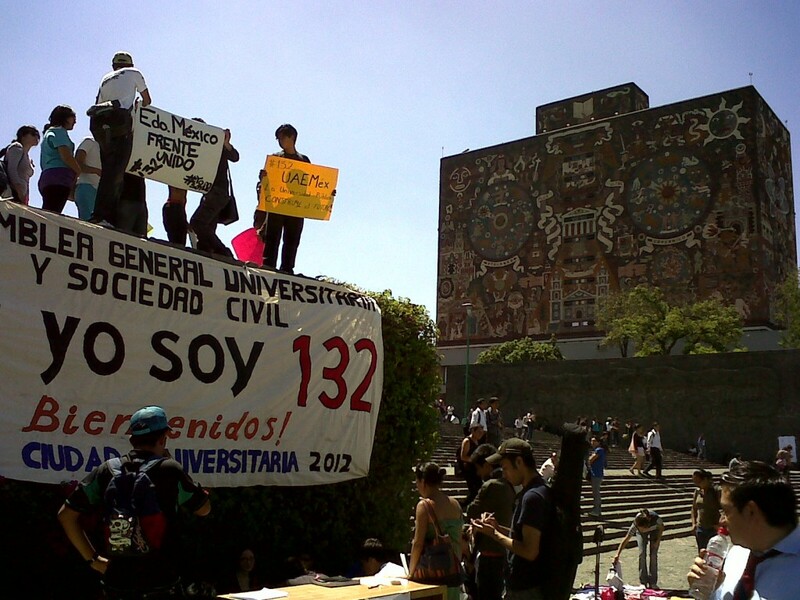 The video went viral and many people sympathising with them showed their support by calling themselves the 132nd student, hence the birth of the #YoSoy132 movement. The #YoSoy132 movement has organised mass protests in various Mexican cities, including protests specifically against Televisa and what the movement considers its biased reporting on the presidential candidates. It can be said that the #YoSoy132 movement is in favour of a true democracy for Mexico, as opposed to the unfinished/corrupted version in place at the moment, in which unlike true dictatorships the citizenry is allowed to vote, but the vested big business interests, whether legal like the neoliberal corporations or illegal like the narco cartels, play an important role in kingmaking. The movement is mainly of young people and students, and also similar to other contemporary movements in Europe, North Africa and the Middle East, and other parts of North America, is seemingly leaderless and horizontal, making use of Internet tools in order to connect and share information. While the movement is unlikely to result in a ‘Mexican summer’ of stopping Pena Nieto winning the election (although on the one hand that is not necessarily its goal – it is a movement in favour of true and fair democracy, and on the other hand there are already rumours circulating of mass protests on Pena Nieto winning the presidency) or provoking a change in media reporting of political matters in Mexico, it has engaged young voters politically in an interesting movement which is potentially disruptive of established political behaviour, especially in the future if the movement can maintain some momentum. Another reason why this is not yet a Mexican summer is the aforementioned level of Internet penetration and use in Mexico. The movement’s power is limited by the mainstream media’s lack of coverage and support for established candidates, as well as the fact that the Internet for socio-economic reasons is not available and used by a large amount of Mexicans. Perhaps if Internet use was greater, the liberating element of the movement would be stronger, as has been seen in other parts of the world. Underdevelopment of communications, thus, is in the interest of the political establishment to prevent their overthrowing. Nevertheless, aside from the protests, there are other signs that #YoSoy132 is more than an Internet-based movement. In #YoSoy132’s name, posters of Pena Nieto have been defaced and stickers put up on the Mexico City metro reminding metro users of the events of San Salvador Atenco and Pena Nieto’s close relationship with the mainstream media. This use of guerilla media tactics reaches out beyond the Internet-literate to the working class and poorer Mexicans which are the main users of public transport. Moving beyond the media to the street (or to the public transport) is an important stage in increasing the visibility of the #YoSoy132 movement and in exposing the truth about Pena Nieto. For Mexico, with its vastly unequal distribution of wealth, corporatist media and increasing problems with narco cartels and violence (including from state quarters), the last thing the country needs is another president who will work with the interests of the rich, whether the ‘legitimate’ neoliberal order, or the illegitimate narco tyrants. This glimpse of the contemporary electoral system of Mexico shows a democracy which in form and in substance is very far from perfect, and despite the efforts of the #YoSoy132 movement, is likely to remain that way for the time being. However, the political engagement of the younger generation, especially in a horizontal democratic fashion favoured by many of their peers in other parts of the world, gives some hope for a better future for Mexico.